It is believed that Bhagavan Sri Ram invoked Goddess Durga before his battle against Ravana in the Ramayana. The tradition of observing Sharadiya Navratri (September - October) started from then onwards. 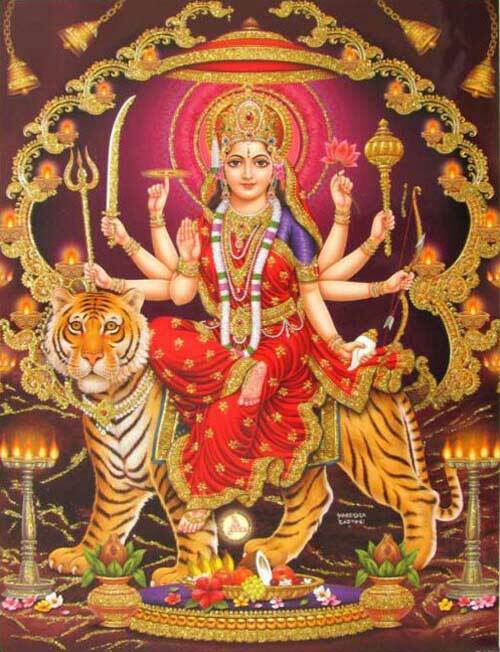 Navratri begins on the first day of the bright half of Ashvin or Ashwayuja (September-October). Navratri ends on the ninth day of Ashvin. The tenth day is celebrated as Dasara or Vijaya Dashami. In Hinduism, Navratri celebrates the victory of Goddess Durga over Mahishasura, the buffalo-headed demon. She fought for nine days and nine nights before emerging victorious on the tenth day. 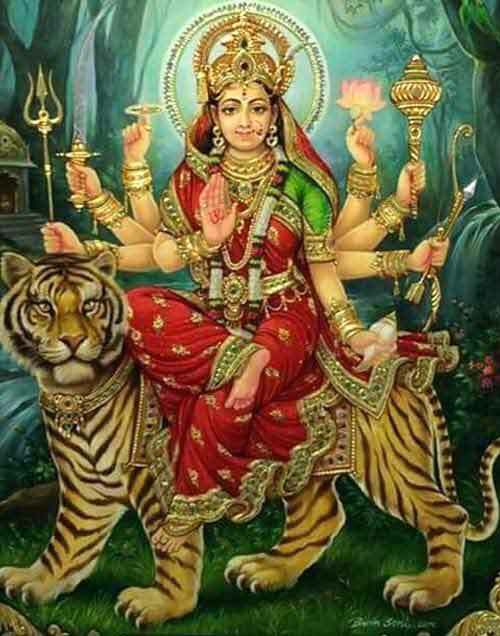 Goddess Shakti in the nine forms is worshipped during the period for knowledge, wealth, prosperity and auspiciousness. Knowingly or unknowingly during this period we also recognize the primordial source of energy (Shakti), which manifests in all living and nonliving. Navratri is dedicated to Goddess Durga and her various manifestations which symbolizes fertility, creation, power, destruction and purity. She is the Mother who nourishes and also Kali that devours all that is Adharmic (evil). Fasting and prayers are an important part of Navratri. People avoid onion, garlic, rice etc during the period. The method of fasting and foods avoided is regional and community based. Certain particular food items are available only during Navratri period. Nine different forms of Mother Goddess Durga are worshipped during the period. Goddess Lakshmi and Goddess Saraswati too are worshipped during the period. They symbolize peace and prosperity attained through wisdom and Dharma. Garba dance and devotional music are an essential part of Navratri. In South India, the period is famous for classical music concerts. Navratri is observed as Durga Puja in Bengal, Assam, Tripura, Odisha, Jharkhand and eastern parts of India. The festival is famous for Mysore Dasara in Karnataka. It is famous for Bathukamma in Telangana. In Kerala, the festival is famous for Vidyarambham performed on the 10th day. The festival is famous for Ram Leela in North India. Navratri is observed four times in a year. The most famous is the one observed before winter in September or October. Next important Navratri is the Chaitra Navratri observed during spring in March or April. The other two Navratris are Magh Navratri (January February) and Ashada Navratri (June – July). Originally, Navratri was observed in March – April. It was Lord Ram who changed it when he invoked Goddess Durga before the battle against Ravana. During the nine days, it is believed that first Goddess Durga fought against Mahishasura. Bhagavan Sri Ram also fought against Ravana for nine days. The nine days symbolically represents the intense struggle against various kinds of evil. Victory is achieved in the end. The evils are present in us in various forms like lust, anger, hatred, jealousy, gluttony, intolerance, untruth, unfathomable desire and ignorance. Nine days is an opportunity for us to come out victorious over the evil hidden in us. Young girl children are worshiped in many regions during the period. Navratri is also the time when warriors worship their weapon, children worship books, and all kinds of tools and machines used for making a living are honored on the ninth day of Navratri.